I’m starting to think that I’m eating way too much cauliflower. I’m using it as rice, replacing potato in hash, faux-potato mash, and even faux ‘English Muffin’, while at the same time I also quite like it as a side dish anyway. But I think this recipe might just be the ultimate as it ticks 2 important boxes: Frank’s favourite food, and making unhealthy food healthy. That’s right, I’m talking about Pizza! Eating the rainbow while at it. 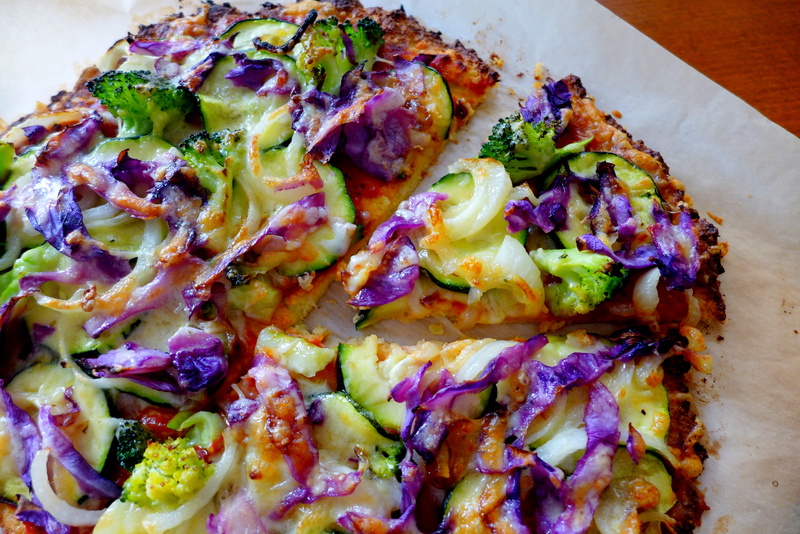 Cauliflower crust pizza doesn’t sound too appealing and in fact when I mention the idea to Frank the Pizza addict he simply said “You can’t cal that a Pizza”. Fine, so I made the Not-Pizza and guess who gobbled it up and then asked for more? Make it vegetarian, make it meatlover friendly, both awesome for your waistline. 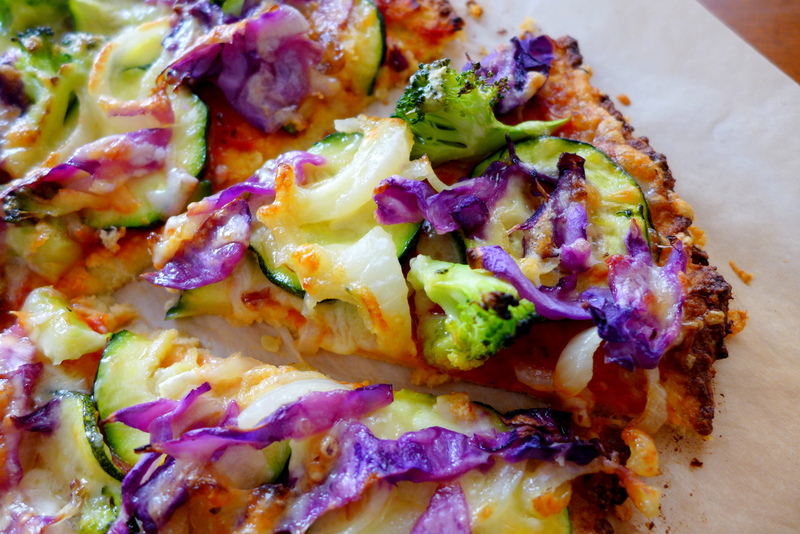 The best thing about Cauliflower Pizza crust, apart from having far lower carbs content and just much more nutritious for us, is that it took hardly any time at all. Gone were the days I slave over the kitchen counter working the dough and spending hours waiting for it to rise, now whenever we feel like having a pizza I can simply whip it up in about half an hour. I just have to make sure I have a constant supply of cauliflower. So here’s how to make this almost guilt-free treat. Wash and throughly dry a small head of cauliflower. Cut off the florets and pulse in the food processor until you get powdery snow like cauliflower, this will take less than a minute. Place cauliflower onto a cheese cloth and squeeze out all the liquid with all your might. Then place the dry cauliflower in a microwave safe bowl and cover, cook for 4 minutes. In a bowl, add the cooked cauliflower, cheese, salt, dried oregano, almond meal and egg and mix well together. Once mixed together, spread the “dough” onto a baking sheet and work it into a flat round. Bake for about 10 minutes in 250C oven until starting to brown at the edges. Now we are ready for the toppings. 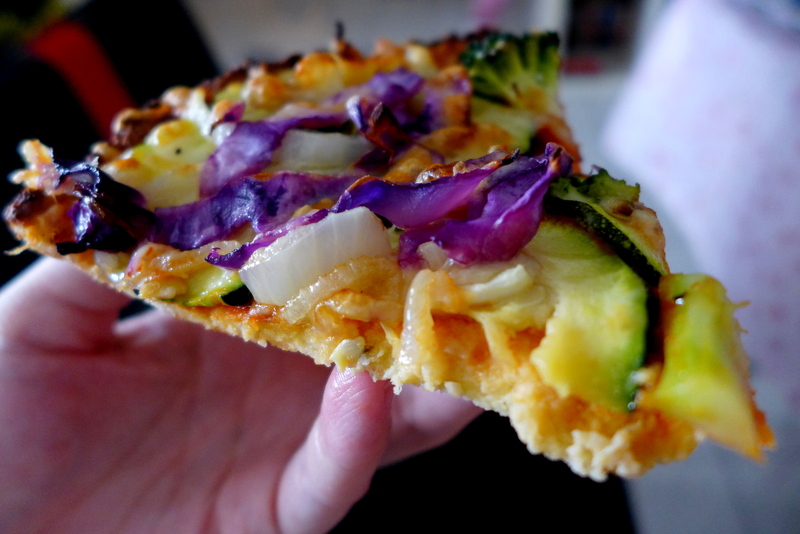 As these would be cooked in a shorter time than regular pizza, I recommend you get started with a sauteeing all the vegetables beforehand, especially the onions. Once the crust is out of the oven, start by spreading spoonfuls of tomato paste (or homemade pizza sauce) on the crust and however much toppings you like. Top with cheese. Bake for further 5 minutes in the oven or until cheese is melted and starting to brown. Let cool for several minutes (very important) before serving so the crust will hold together. Pizzas are always vegetarian here because Frank rarely eats meat. I love adding colourful vegetables as I believe we eat with our eyes and of course extra antioxidants can’t hurt. 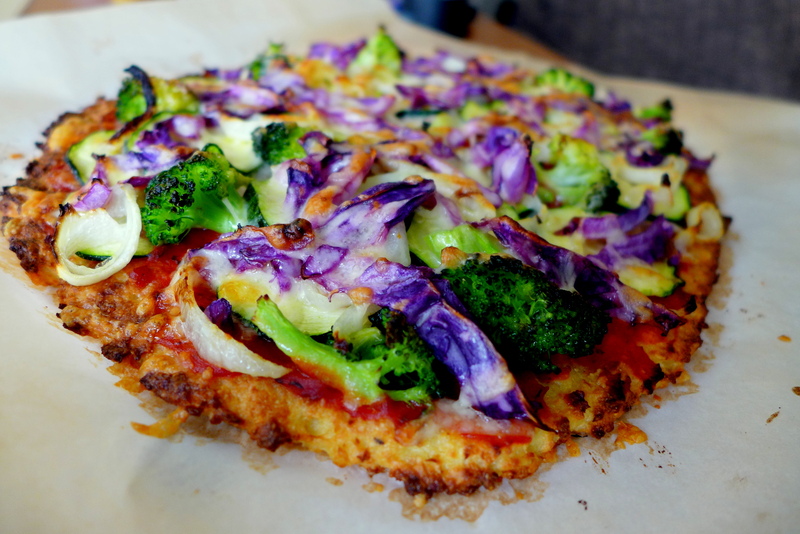 I do believe the cauliflower crust tastes better than the regular wheat flour dough, but you might want to try it out to make your judgement. The base holds together perfectly, tasted cheesy and aromatic. The edges are slight crispy while the middle is soft but not really fluffy like regular pizza. It’s a winner! No doubt this will be our regular. Pizza is more delicious eaten with hands. Oh yeah, cheese is not included in the Paleo diet. But as long as you are not lactose intolerant, there’s no problem consuming dairy at all. In fact most cheeses would have lower content of lactose and you still get the nutritional benefits. So treat yourself once in a while and stick to full fat cheese. Busy weekend ahead! Shall see you again sometimes next week if I made it through (recovering from respiratory woes no thanks to the crazy hot weather and my easily-overheat-body). Thanks Kelly, I am going to try this! I’m not a fan of cauliflower, but if it means I can trick my hubby into eating vegetables then will give it a go! Frank doesn’t like cauliflower either. I don’t think you can taste it in the crust though as the cheese would cover it. The most colorful pizza I have ever seen 🙂 Looks great and must be delicious! Oh oh… this is waaay too great recipe. And healthy! Hope you get to try it soon. Kelly, it looks awesome! Will definitely try this!